There is no ‘one-size-fits-all’ customer service outsourcing solution. There are significant differences across industries, and between companies within industries. Every company has its own brand, its own culture, something that makes it unique. getsix® extensive training, comprehensive variety of services, vast resources, leading technologies, and flexibility enable us to customise our customer service outsourcing capabilities to fit your requirements, whatever those requirements may be. getsix® solutions are based on our ‘Business Model & Visions’, taking into account how today’s business complexity could be organised in a productive manner. Scope of services – In this section getsix® would like to point out and explain, that we could act as a classic ‘Accounting Office/Tax Adviser’, or as a BPO provider to take over i.e. your accounts payable process. This gives us the possibly to provide ‘Consulting Services and IT solutions’ under one roof. Our getsix® competence network and our co-operation’s and alliances’, even make it possible to act as a multi-disciplinary service provider. Based of service provision – Although ITO and BPO services are designed to complement one another, it makes sense for an organisation to receive the services provided by one provider. To provide such benefits for our customers we have focused our ‘Business Model and Vision’ in such a way, that we a can either act as a sole BPO provider, a sole ITO provider or as an Outsourcing provider, who can offer both services in integrated solutions, also called as Business-Processes-as-a-Service (BPaaS). Based on our own managed IT Infrastructure which is maintained by getsix® IT Professionals and our respective partnership with Microsoft (SPLA-Partner), we are also able to act as a sole Software-as-a-Service (SaaS) provider mostly for Microsoft Products. Kind of deployment – Due to our approach to offer our customers solutions which fits exactly their needs, to enjoy all the benefits of working together with an BPO service provider like getsix®, we have several possibilities how we deploy our services. The hybrid model or dual-shore model leverages on-site/off-site efficiencies to delivers results to our customers at reduced costs. 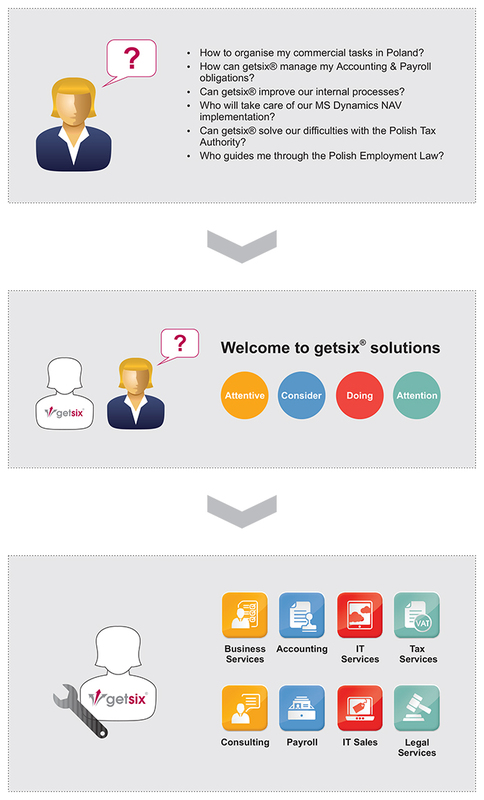 getsix® customers are involved in this model of deployment in the specific business process (i.e. HR & Payroll processing), as we work alongside the client’s team to perform around 80% of the work while the customers team executes 20% of the work to leverage the cost, labour and technology advantages of outsourcing. Size of business – Each business size has several possibilities to benefit from our services. In our philosophy to be a part in the business world each customer in which size has for us the same importance. This also makes us prepared to grow together with our customers with the years of co-operating. getsix® can tailor our services in such a way, that i.e. we are able to provide One-Stop-Shop solutions for smaller and midsized companies and i.e. dedicated services for multi-national or multi-location companies. Industry – getsix® services which we offer can be used by any kind of companies who have the need to optimise their finance commercial. But on the other hand we also can offer tailored solutions for specific Industries based in our experience with our actually served customers from this specific Industry. Technology – Disruptive and innovative technologies capture today’s headlines, but the real value comes from using those technologies – and a service-based approach to essential functions and capabilities – to reinvent your business model. Business Process Outsourcing (BPO) can advance you more quickly along this revolutionary road, helping you reinvent and reassemble the services and technology innovations you need to drive growth and competitive advantage. For example – Enterprise Resource Planning (ERP) outsourcing provides a combination of services designed for customers who are either unable or unwilling to tackle the responsibility for installing and managing the complex application, but who want the management information and control that it provides. If customers believe that their company cannot support the rigors of installing or maintaining the management requirements of an ERP system, then ERP outsourcing is an option for them. ERP outsourcing is a business partnership that allows the customer to have the best system possible, without the facility or staff necessary to maintain and manage it. Departmental tasks – Business Process Outsourcing (BPO) empowers companies with new ways to achieve high performance by controlling costs, reducing risk, fostering collaboration and increasing transparency. Our team of industry and technology experts offers a consultative approach to evaluate your business and recommend the processes that are potential fit for outsourcing to optimise your business processes. getsix® offers a wide range of BPO services which are supporting typical departments each company has. To give potential customers a better overview how our solutions and services could support your different company departments we have grouped our solutions accordingly. Regarding geographic regions – Though outsourcing and offshoring may simultaneously take place, the two differ in terms of location and worker selection. When offshoring occurs, a business moves all or some of its activities to another country. Outsourcing, on the other hand, is the process of utilising third party workers for traditionally in-house business tasks; this may take place either inside or outside the company’s home country. Outsourcing is a common practice that businesses use to cut expenses, gain access to employees with a special skill set, and obtain other benefits. Unlike offshoring, outsourcing does not need to take place in a separate country to occur. Businesses that remain in their countries of origin may seek out local third party workers, resulting in outsourcing. Outsourcing can, however, take place outside of the company’s country of origin as well. Please find on the following pages information about, which services getsix® can provide for companies which do not have their registration in Poland.